and online requests for spare parts! SmyCloud is now available for SMI customers; it is an innovative service of interactive web-browsing of both technical manuals and lists of machine spare parts, where requests for quotation can be automatically created. SmyCloud is accessible from our website in Smipass section (https://www.smigroup.it/smipass/ by entering dedicated username and password. Click here to request your personal log-in codes! 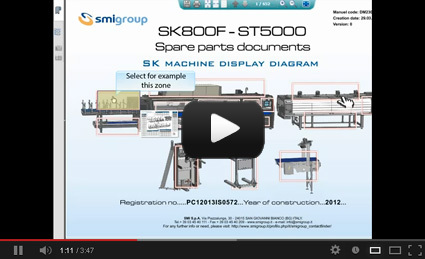 All customers who purchased a machine from SMI in 2011 and/or 2012, by requesting username and password through an on-line form. file archive of all requests for offers, orders, etc. 1. Consultation of use and maintenance manuals and electrical diagrams. Consulting online machine technical manuals is easy and user-friendly; moreover, electrical diagrams are always updated to the latest release. 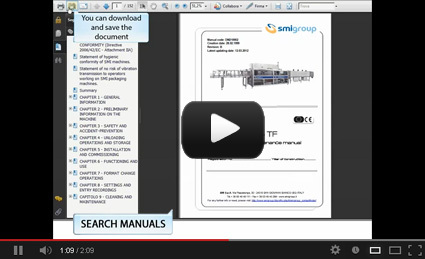 Technical documentation can be saved as a pdf file on the user's personal computer or tablet in order to allow off-line browsing. Click on the following picture and follow the instructions of the tutorial. 2. Consultation of the spare parts manual and creation of a request for offer. through a simple click, the user can email the shopping list to SMI Spare Parts Department, which in response sends back within short a detailed quotation of the spare parts contained in the list. Smipass is a reserved area of Smigroup's website, set up to offer customers a high value-added platform of after-sale services and provide them with an up-to-date database of their machines (technical documentation, services, requests, etc.). SmyCall, a dedicated phone helpline including a recall service by SMI expert technicians; SmyCall is free of charge while the machine is under warranty, then it is provided upon payment of a small annual fee. For further information about this new service you can contact us at stefano.preda@smigroup.net, who shall assist your during SmyCloud's activation procedure.